Of course, I can’t go to London and not visit some good cafes. First on my list this time was a restaurant/tapas bar called Providores & Tapa Room, 109 Marylebone High Street in Central London and owned by New Zealanders. It was recommended to me by the editor of Olive Food Magazine (my favourite British food magazine). I was naturally excited as there was somewhere else to try apart from my favourites. After a bit of window shopping down on fashionable Marylebone High Street, I arrived at my destination, only to find a queue coming out. At first I was a bit upset, thinking, I’ve flown 100s miles to get here and I only have about 2 hours to visit coffee shops and I have to queue – then I thought, “hang on a minute” this means I’m onto something good here, as I’ve only seen queues coming out one coffee shop before; Flat White on Berwick Street, London. So I waited patiently and as the waitress came out checking for numbers, I was almost pleased to say, “just for one and I only want coffee” – well it got me in straight away. The Tapa Room (downstairs of the main restaurant) is quite squashed, with a massive communal table with high chairs bang right in the middle of the shop, supported by small French style cafe chairs and tables round the side. I saw that they were using a commercial Gaggia coffee machine. I ordered my cappuccino as it was still before 12pm and it came with some latte art, a slightly skewed rosetta. I took pictures of my coffee and the shop, which I will share with you when I figure out how to upload them onto my blog, took in the ambience, smelt my coffee and drank it all in almost 2 gulps. Ahhhh ! 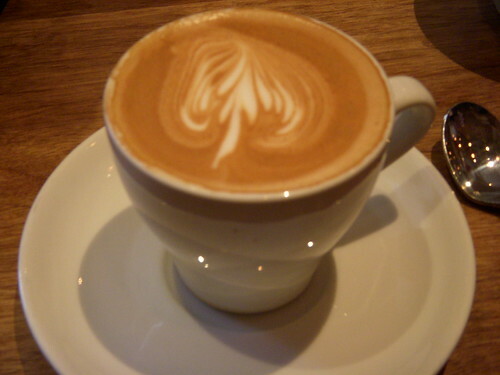 What a lovely cup of coffee – it went down smoothly – the frothed milk was silky smooth and the coffee just blended into my stomach – I did not feel like I’d just drank something heavy, which shows the quality of the coffee preparation. I hear that they sell their organic coffee beans, which apprarently comes from Monmouth Coffee shop. This entry was posted on Thursday, December 6th, 2007 at 6:51 pm	and posted in Bean There - Cafes. You can follow any responses to this entry through the RSS 2.0 feed.